The Chart Chick: Games, Games, Games! 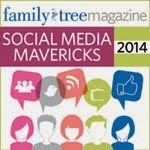 If you are heading this way, I am sure you are in the full throes of Rootstech preparation. We're right there with you! Something we are very excited about to share with everyone at Rootstech are the things we've been doing to make your family history fun and games. That's right, I said it, games. We're playing games and we're offering some great new games for you to purchase to use with your custom Family ChartMasters chart or at family reunions. I'm telling you, it's going to be a fun time over in booth 1240 this week. You've got to stop by and check out what we have happening. First, we'll be playing our Pedigree Challenge game at the booth (1240). Come test your genealogy chops by playing hide and seek with our giant Ancestor Chart. How old was Albert when he died? Who is Hortense's great-granddaughter? Who is June's husband? Who is Lawrence's oldest grandchild? Swing by, drop into the game, win a prize! 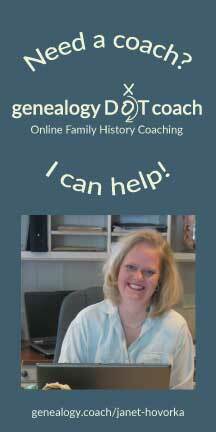 It's a fun way to test yourself and see how you size up on the genealogy game field. 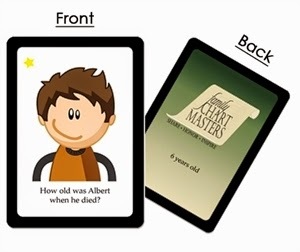 Family ChartMasters will be offering a brand new card game that you can purchase to play games with your family charts at family reunions and game nights. This is great to have on hand and get family conversations going. Take a look at what I am talking about here. We'll also be offering the very popular and fun Your Family Tree Game for sale. This is a great game whether you are 4 or 104. We'll be playing this game on our Zap the Grandma Gap side of our booth so you can give it a whirl. It's really fun and perfect for family game nights, family reunions, youth activities, and more. We've enjoyed it a lot in our family and also at a staff meeting (yes, you read that right...we have fun around here while we work). You'll definitely want to take a look at it. And then, of course, what is Outside the Box without games? I mean, that's like a birthday party without cake. So be sure to check out our schedule for lots of great, free mini-seminars. We'll be kicking off and ending our Outside the Box sessions with some more games though. Come see us on Thursday, February 12th, from 10:30-11:00 to try your hand at our Genealogy Game Show (go head to head with other genealogists from around the world in a Jeaopardy-like game) and our Pedigree Challenge. There are prizes involved so you don't want to miss it. We'll cap Rootstech off with another round of both games once more on Saturday, from 3:30-4:00. More fun and more prizes has to be the best way to end your Rootstech stay! We are into the celebration spirit over Rootstech and the fun and games we are planning are just one way we're showing it. Be sure to check out our booth (1240) for amazing products, chart consultations, books, games (to buy and play), prizes, or to just shoot the breeze with folks from our Family ChartMasters team. We're looking forward to seeing you!